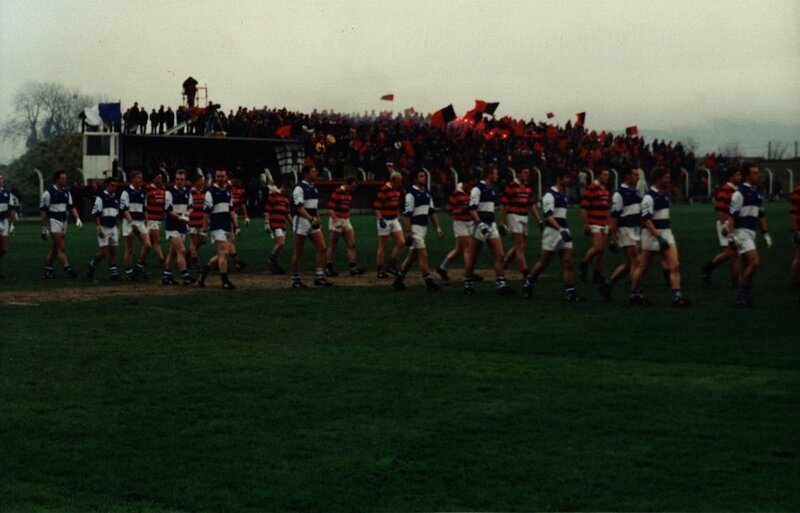 Original Report: The Corkman, Friday, December 11th, 1998. Glory day for Newmarket. Duhallow side regain county junior football title after a lapse of 28 years with superb victory over young Killavullen selection. 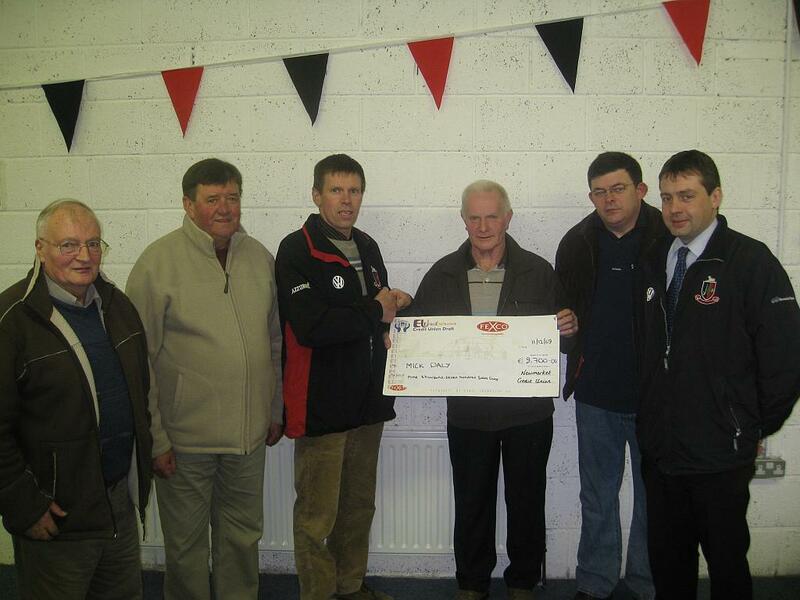 NEWMARKET regained the county junior football championship title after a lapse of 28 years, their only previous victory having been in 1970, when they overcame a mighty challenge from Killavullen in a great final at Charleville on Sunday. It was a game of fast, vigorous football that throbbed with life from start to finish as two fine teams battled it out for the title. At one stage of the second half it looked as if Newmarket were firmly on the road to victory, having scored five points without reply to go two in front by the 42nd minute, but Killavullen launched a great counter-attack in the last quarter and had only themselves to blame for at least not putting the game to a second meeting. While they were assaulting the Newmarket defence in wave after wave of attack, the Killavullen forwards were very wasteful with their chances, shooting a succession of wides even from good positions. Newmarket defended strongly, often forcing the Killavullen men to kick hurriedly to avoid tackles and that certainly contributed to their erratic shooting although not being the sole reason. The tally of wides tells its own story, with Killavullen chalking up 18 wides over the hour to Newmarket’s five. Newmarket triumphed because they used the ball to better effect when they went forward, especially during their period of superiority in the third quarter, during which they rattled over five points without reply in a twelve minute period. 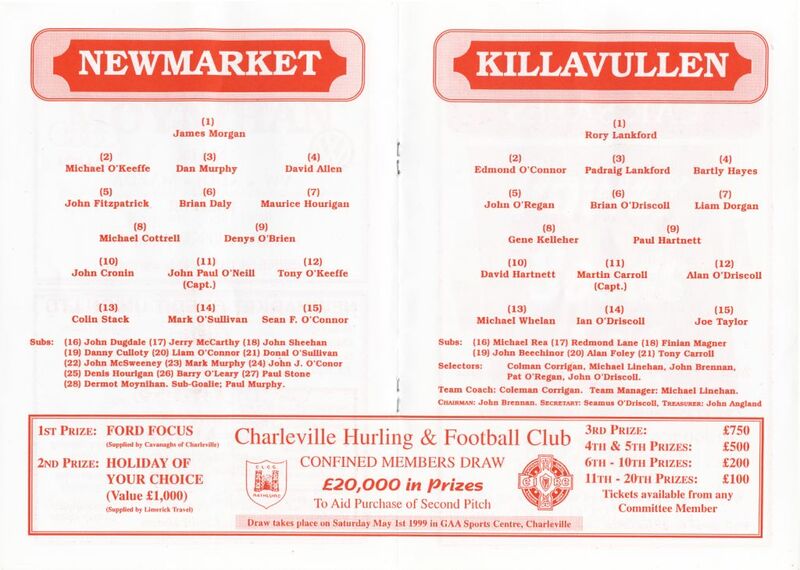 Facing into the last quarter, the odds were very much on a Newmarket victory because of their dominance of the play from half time onwards, but then Killavullen won back the initiative and exerted a strong grip on the play between then and the end, but with very little reward. The result sparked off massive celebrations by the Newmarket team and supporters, as one might expect, for it had taken the club a long time to climb the heights achieved in 1970 when their great team of that period beat Adrigole in the final. There was only one direct family link with that side, with their centre half back on Sunday, Brian Daly — who had an outstanding game — following in the footsteps of his father, Billy, who played at midfield in the 1970 final. Killavullen had never before contested a county final in this grade, with their victory in this year’s Avondhu championship being their first ever and they won the admiration of all present for a magnificent display, even though it was not enough in the end to bring them victory. They started off in most impressive style, utilising their great speed and slick passing to put the Newmarket backs under severe pressure. 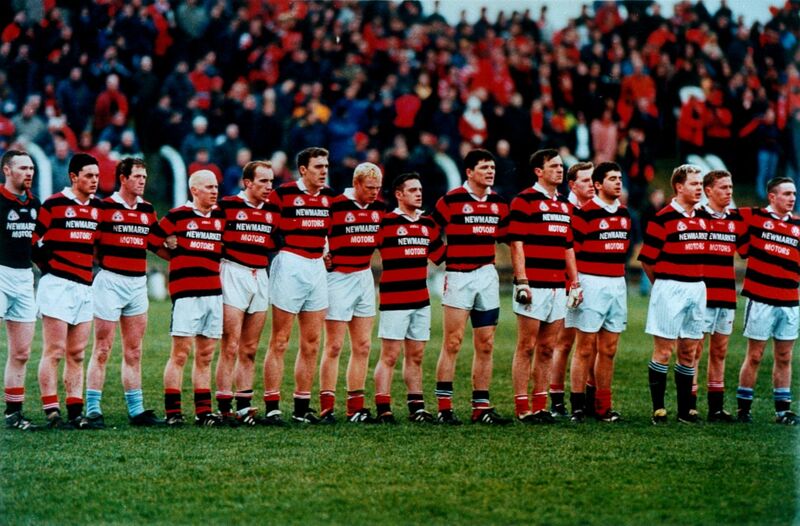 By the ninth minute they were leading by three points to nil, two of their scores having come from frees by Martin Carroll and the other from Brian O’Driscoll. But already they were giving a foretaste of things to come when sending wide from other good chances. After ten minutes Newmarket began to come strongly into the game, and they had their first score in the 12th minute when Tony O’Keeffe made a great goalward run before kicking a point from close range. That was followed by goaling efforts from Mark O’Sullivan and Danny Culloty, with the Lankford brothers, Rory and Padraig, saving the situation for Killavullen before John Paul O’Neill pointed for Newmarket at the end of a move involving Culloty and O’Sullivan. After a period on the defensive, Killavullen drove forward again and points by Martin Carroll and David Hartnett had them leading by 0-5 to 0-2 by the 18th minute. Indeed, Newmarket were lucky that goalkeeper James Morgan was in tremendous form when he brought off a great save from Ian O’Driscoll in the 20th minute. Morgan won the man of the match award after the game and not without good reason, for he not only frustrated Killavullen’s goaling efforts on several occasions but went high to bring down two balls heading over the bar as well. 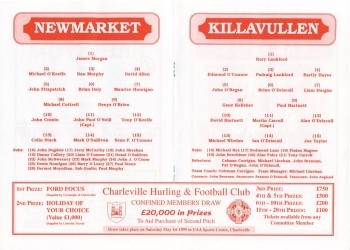 Danny Culloty, who started at full-forward, came to midfield for Newmarket midway through the first half and made an immediate impression, teaming up with the outstanding Denis O’Brien to break the grip which Gene Kelleher and Paul Hartnett had earlier exerted for Killavullen in this region. 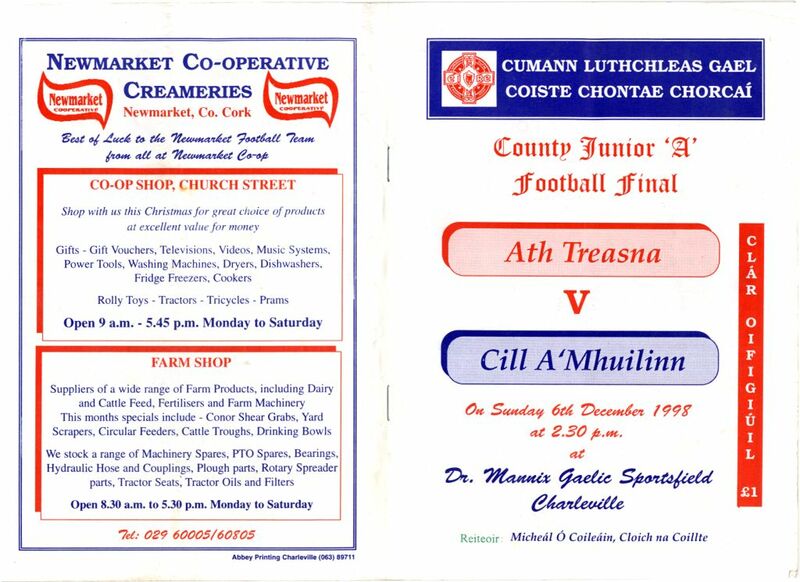 A great point from a free by Culloty, kicked from a distance off the hand after a good clearance out of defence by Maurice Hourigan, reduced Killavullen’s lead to two points in the 23rd minute, but Martin Carroll (from a free) extended it again to three (0-6 to 0-3) by the interval. Despite the fact that they were trailing by three points at the break, the omens looked reasonably good for Newmarket, for they had settled in well after Killavullen’s blistering start and they could look forward to the wind advantage in the second half. And it all began to come right for them as the second half got under way. Tony O’Keeffe had a point within two minutes of the restart, the ball coming to him via Michael Cottrell from Mark O’Sullivan’s sideline kick and Denis O’Brien added another point within a minute after having been sent away by Culloty. Mark O’Sullivan brought Newmarket level with a point from a free in the 35th minute, stemming from a foul on Michael Cottrell after a move started in the half-back line by John Fitzpatrick and so complete had been the dominance of the Duhallow champions from the start of the second half that it looked as if they might be about to take full control of the game. But those notions were soon scotched when Killavullen launched a few attacks which brought real threats of a goal. 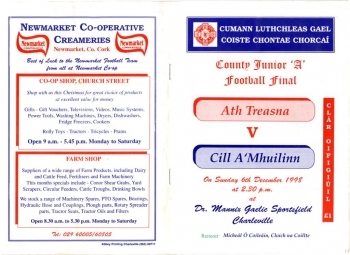 The first of these came when Martin Carroll sent the ball in low from a free and a save in the square averted the danger before Newmarket cornerback Michael O’Keeffe brought it away to effect a fine clearance. Having survived these onslaughts, Newmarket began to put on pressure at the other end and scored two crucial points, the first by John Cronin from a pass by Mark O’Sullivan and the other by John Paul O’Neill, who took full advantage of a ball sent in from the right wing by Sean Francis O’Connor. Newmarket threatened for a goal on another occasion when Michael Cottrell sent a high ball into the goalmouth, with Tony O’Keeffe in a favourable position behind the backs, but a great leap by full-back Padraig Lankford cut off the danger. Approaching the last quarter, Killavullen began to step up their performance, with Brian O’Driscoll (who gave a great display over the hour) moving to midfield to make a big impression, the half-back line of John O’Regan, Liam Dorgan and in succession Paul Hartnett and Ian O’Driscoll, giving a strong back-up from that region and Gene Kelleher moving forward to figure prominently in an attack which was ably led by team captain Martin Carroll. 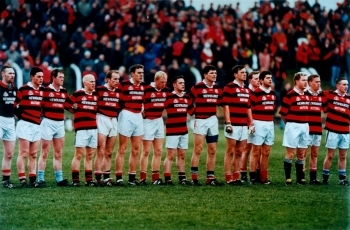 The result was that Killavullen launched attack after attack but reaped no benefit on the scoreboard with the ball being driven wide time after time and the Newmarket backs showing considerable skill in blocking down goaling attempts, with their full-back line of Michael O’Keeffe, Dan Murphy and David Allen being very steady. From one of their few raids during this period, Mark O’Sullivan pointed a free for Newmarket to put them three points clear with eleven minutes to go. Almost unbelievably considering their strong performance-through the field and their promising approach work, Killavullen’s first score in the second half did not come until the closing minutes of the game. Alan O’Driscoll fired over a point, which was followed by another from Brian O’Driscoll just before the final whistle to leave them still a point short. And so the result was a great victory for Newmarket who had to survive the loss of a number of key players during the campaign and gallant display by a young Killavullen side which will surely be heard of again. 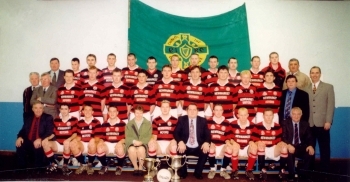 Killavullen: R Lankford, E O’Connor, P Lankford, B Hayes, J O’Regan, B O’Driscoll, L Dorgan, G Kelleher, P Hartnett, D Hartnett, M Carroll, A O’Driscoll, M Whelan, I O’Driscoll, J Taylor. Sub: T Carroll. Scorers for Killavullen: B O’Driscoll (0-2), D Hartnett (0-1), M Carroll (0-4, 0-3 frees), I O’Driscoll (0-1).